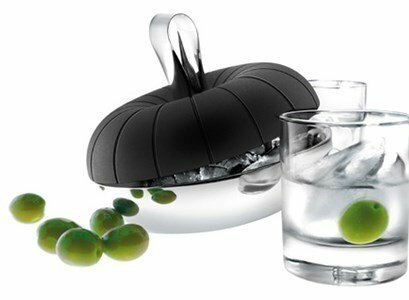 With the ice cube cooler by Eva Solo, designed by Claus Jensen and Henrik Holbæk, you can make and serve ice cubes, all in one utensil. It is as simple as pouring water over the rubber tray and put it in the refrigerator. As soon as it is frozen, pour the ice cubes into the stainless steel bowl.. 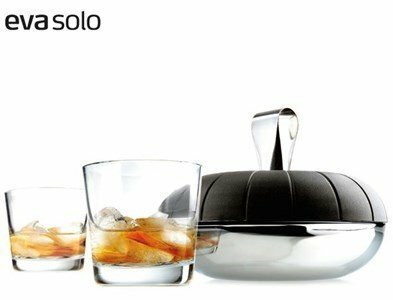 The double-walled bowl, made of stainless steel, keeps the ice cubes cool for longer. In the handle of the lid you'll find a pair of tongs to serve the ice cubes. Enjoy a cold drink with your friends, with the company of the Eva Solo ice cube cooler. The double-walled bowl keeps the ice cubes cool for a longer period of time. In the handle of the lid you will find a pair of stainless steel tongs to serve the ice cubes. Use the tray as a lid and put away the tongs in the hole especifically designed for that purpose. It holds 16 ice cubes. Grand Prix de l 'Art de Vivre 2003-Maison & Objet Paris, France.